Dream in Color...: Let's Polka! Polka Dot that is! This week's Stamp Simply Challenge (ssnotime101) is to go dotty...polka dotty! Polka dots are my favorites--this is no challenge for me! I began with Crate's Baby Bee designer paper. The peachy dotted paper is layered over Gina K.'s Pure Luxury Ivory cardstock, with one layer scalloped by a SU Scallop border punch. The top corners of the layers were corner rounded with SU's corner rounder punch. My sentiment, from Our Daily Bread design's "Jesus" set, is stamped with Versafine Sepia ink, then clear embossed with SU Clear EP. My Spellbinder Ovals can in handy once again to die cut the popped up image panel and framing oval. Last, but not least, this amazingly GORGEOUS Prima blossom that I purchased from Our Daily Bread designs. They are my absolute favorite new embellishment! They dress up a sentiment or Bible verse just wonderfully! If you decide to play along with us, please remember to use the keyword ssnotime101 if you upload to SCS. Then be sure to link back to Sharon's blog--we want to see your design! Beautiful, Deb!! That flower is stunning!! This is a Beautiful card Deb! Love the colors and that flower is gorgeous! Simply stunning, love everything about this amazing card. Thanks for the inspiration. I love this card. I know fall is around the corner and this is a sure reminder. This is gorgeous Deb!!! Love the color choice!! Hope you have a fun filled weekend ahead!! What a stunning card!! I just LOVE that gorgeous flower! Beautiful card, Deb! That flower is amazing! Oh my gosh, girl!! This is AWESOME!!! I really love orange and red and yellow and you make the most beautiful cards every time you use those colors. I am DOTTY over this one! Absolutely gorgeous Deb!!! What a gorgeous flower!!!! Love the rich colors and I just think you focused in on this wonderful Scripture soooo well! I love it!!! Saw this at SCS and had to blop over to comment here, Deb! The card is gorgeous!!! beautiful Deb!! so very romantic!!! have a fabulous weekend! I knew your card would be something very elegant and gorgeous and I was right!! Simply beautiful, Deb! that flower is fab! Love this! Wow Deb!! This is stunning!! I love the flower, the color and the layout!! Hope you have an awesome weekend!! SUCH a gorgeous card -- totally out of the park! 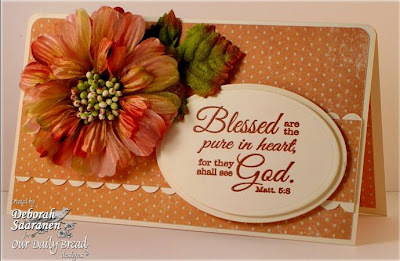 What a beautiful card with that flower and awesome Bible verse! True beauty! Wow, the flower is stunning! Beautiful card!!! this is A-MAAAAAA-ZING! Such beautiful colors and detail! GORGEOUS! Wow Deb, stunning! Love the Prima flower, a beautiful design! Awesome! I love those Prima's too! Pretty colors!